Cannot find my Jupyter notebooks under Recent Notebooks – IDEAS? What Should We Do Next? Sometimes after launching Jupyter notebooks you may discover that your notebooks don't show up under Recent Notebooks section in the right nav bar, and may not even show up if you search for them in the Search/import bar on top of Jupyter notebooks. This can happen if you deleted your browser cookies for datascientistworkbench, or if you launched Jupyter in a new Private (Firefox) / Incognito (Chrome) window, or due to a bug. 1. 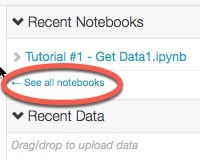 Click on the See all notebooks link under Recent Notebooks in the right nav bar. 2. 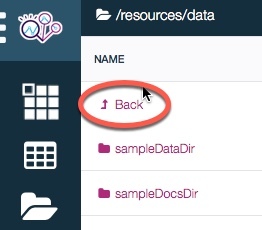 Use My Data: Just click the My Data (folder icon) in the left menu bar. Once it opens just click Back, to go up one level to /resources and you can find your Jupyter notebooks there (may need to scroll down a little). 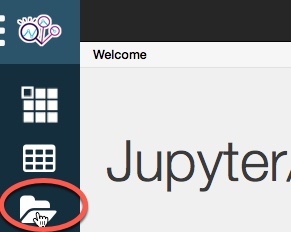 Click on the desired notebook (.ipynb) file and it will open up in Jupyter.